I like to tinker. I like things mechanical. A little music is good too, especially if it is creative. And I love things that are free: like the wind. The sound of it, the feel of it on my face, and the intrinsic energy inherent in it. Over six years ago, I put up a rooftop-mounted wind generator, and then another the following year, and then a third a year or so after that. It wasn’t hard to do and didn’t require any special-function tools, just the regular ones everyone has. Even so, I figured that I better leave the tools handy. Those mechanical whirlygigs, I supposed, will need attention, and more than likely, lots of it and real soon. I get a typical wind of 10-15 mph almost every day, stronger in the winter, and much stronger in a storm. Notice the weather-beaten and wind eroded appearance of the stain on my homestead, certainly in need of a fresh coat. I even had a hurricane back a year or so ago. No one liked that. Not the house, not me, not even the wind generators. But nothing broke, so those tools still lay dormant! Normally, due to a genetic flaw from somewhere in the past, I seriously lack organizational skills. I just leave my tools wherever the last project was. This tool filing system came about from having to drop everything and quench the fires typical of every do-it-yourself homestead. Then, of course, there were those especially special fires, the hot ones, the ones you can’t put off, not even for a moment. We all have them. Mine may involve immature but awful big and awful friendly livestock playing with the ladder I’m standing on, or even worse, a bunch of eternally immature Australian shepherds trying to herd a slow-moving porcupine or an even more recalcitrant skunk towards an open door. Such episodes dull the mind, they so laden it with immediate panic that not only is the tool hopelessly mislaid, perhaps even thrown, that even after the rescue, (or climbing back up the ladder after being tossed off it) my brain is still dulled to the point where I cannot even recall WHAT I was working on… the tools laid down or tossed in haste, become hopelessly lost almost forever… until the lawnmower finds them. But, for the most part, sans panic, this drop-’em-where-you-are process works out ok, I only have to remember what the last thing I worked on was and… voila! there are the tools. All in all, it works pretty well for me. Of course, now and then I need to have duplicate sets of cheap Chinese tools scattered around. I’d be derelict if I didn’t mention to you, however, that this filing concept breaks down when it comes to rooftop projects. And since this is dealing with a rooftop project, I best mention that this filing system works dangerously poorly for this kind of project. Being clanged on the head by a big pipe wrench, even a cheap Chinese one, rolling off the roof because the roof somehow knows I am within reach is not my cup of tea anymore. I don’t think it is anyone’s cup, except perhaps Evel Knievel, but I think he is dead. Or at least severely wounded. So, it comes down to this: when the wind turbines get broken, I have to hunt for the tools because I know they are not on the roof. That could take days; it could even take weeks, but the doggonnest thing is… the dang wind generators don’t break! So much for tinkering. So much for chaos, one less need for duplicate cheap Chinese tools or choice words because the tools are not on the roof where, in a perfect world, they should have been left. Who needs tools if the dang things don’t break? Well, I suppose, there’s still the tractors… they are always broken, or rusted, or… well, never mind! Alas, that’s not entirely true. There have been some repairs made to the wind generators and this update to the Rooftop Wind Farms article is designed to highlight the maintenance issues I’ve faced and then pave the way to subsequent articles on installing a fourth wind generator. To recap from the Rooftop Wind Farm article, I have three roof-mounted wind generators: two Southwest Windpower 400 watt Air-X units and an 800 watt Mallard 800E along with some solar panels that supply my electrical power needs. I do have, and I highly recommend if you live off-grid, a backup gasoline-powered generator. In fact, I have two backup gas generators; one is a small 1,000-watt unit that I use most when the sun and wind abandon me for more than 4 days at a time. It is a cute little fuel miser that will run my computers, both at once when I need to, plus fire up lights, a boom-box, low-power tools and assorted other things including the radio dish for my internet connection, wireless router and some other electronic doo-dads. I also use a second and larger gas generator, a 3000-watt unit, to juice my power tools or water pump… the big boys, the watt suckers, like the two-burner electric stove I use for burning dinners on occasion. It is less miserly on gas so I use it only when required. But with the backup generator, I can cook beans and steak at the same time. I cannot with my alternative energy setup and do not mean to imply that it is a totally sufficient system for the typical household. At least not at the scale I live on. Air-X, west side of roof: Burned out control circuit board 1st year of service, repaired under warranty by the factory. Air-X, east side: Same thing, first year of service, circuit board replaced under warranty. A replacement circuit board was sent to me free of charge from the factory with instructions on how to install it. Oh boy! I get to use tools. Where might they be? Mallard 800E: In the 2nd year of service it suffered a bent hub, that’s the thing that secures the blades to the rotating shaft. The hub was replaced with a new design, one that is stronger and lighter. Cost: around 25 bucks, 28 bucks if you include new cheap Chinese replacement tools for the ones you can’t find, thirty bucks to include a can of shiny paint to match the rest of the unit. Oh boy, once again, more roof-time. Replaced ALL rubber vibration isolating mounts on the mast, way more than once. Eventually, I changed them all to solid mounts with rubber spacers. I only had to do that once, problem licked. Air-X east side: Tossed its plastic nose cone in year 3. Nose cone retrieved from the meadow and I epoxied the cracked cone then reinstalled it. Two weeks later I had to fetch it again, same meadow, about the same distance away. No more epoxy, it is now and forevermore running without a nose cone. Air-X west: Blown fuse. This is a very noticeable condition with the Air-X’s although it took me about 20 minutes of head scratching to figure out what was going on the first (and only) time it happened. When a fuse in the Air-X blows, the unit will free-wheel and winds up to full speed, the internal speed control senses this and slams on the brake. The brakes are nothing more than a feedback of generated current into the armature windings that creates an electro-magnetic drag on the rotor. This slows the rotor and the brake releases. Then, the unit spins itself crazy again until the brake once again slams it to a stop electro-magnetically. This will go on and on unmercifully until you realize the fuse has blown and replace it. To correct this, I put the stop switch between the Air-X and the fuse. Now if the fuse blows, the stop switch can still be thrown to the closed position which shorts the windings and puts a drag on the rotor at all wind speeds. The Mallard does not have the electronic brains like its sisters, the Air-X’s. There is no automatic electronic braking feature. 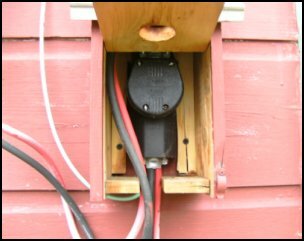 I use a stop switch positioned between the fuse and the wind generator that will short the windings to create the drag. Otherwise, without a stop switch positioned “upstream” of the fuse, the Mallard could spin itself to a violent death if the wind is strong enough. That’s it! No other repairs, not even tune-ups. Well, no, that’s not true. I did clamor up on the roof one more time to adjust the voltage control unit on the Air-X’s to the OFF position. That was necessary after I installed a diversion load controller on the battery bank inside the house to take over the control functions. Note that the Mallard does not have any circuit boards or control electronics in its housing. A definite plus in my experience. Robust little things these little wind generators are, I must say, but if you are a tinkerer, it can be a dilemma. There’s just nothing to do but sit, watch and listen to them sing … all day long. “No fix-ems”, they should call them. My tools are rusty from repose… at least I suspect they are, I can’t find them since they are not on the roof where, according to my tool filing system, they should be. One other maintenance issue to be aware of is that in the winter, after a wet snow and cold windless night, the blades can ice up and not spin until the sun comes back out to melt the ice, generally the next day. I have yet to climb up on the roof to de-ice the blades, a particularly treacherous thing to do on a metal roof in the winter. So, that’s it for maintenance. Let’s talk about cost effectiveness. Bear in mind that I’m not a financial genius. Does it make sense to generate your own electricity? Will it pay off in your lifetime? It did for me. Although my circumstances are a little unique, with the wind generators, the pay-back period was almost immediate and well in my favor. I’m often asked how long it took to break even on purchasing and setting up an off-grid facility. The cost of a small (read that as very small) system like mine is relatively budget-friendly: less than $600 each for the Air-X’s, $385 for the Mallard. There’s additional costs of around $250 each unit for pipe, mounting hardware, wire, switches, gauges and other support equipment (like replacing lost tools), not counting the free labor… mine, or kids’, if you can find them. There’s also an inverter and batteries to consider and that could get expensive depending on your choices. Miserly me took the cheap road during the learning phase, Wal-mart batteries (deep-cycle kind, about $60 each), 5 of them, and two 750 watt inverters for about $79 each. I’ve added more items along the way but for the most part, the above represents a functional basic system that has worked well for me. I don’t use much electricity, hence I don’t generate much electricity, or is it the other way around? In either case, does it make more sense to generate it or just buy it from the locals? Aside from personal philosophy and the thrill of doing it myself, in my case, it certainly made sense to generate it myself. With a minimum $30/month electric bill, ordinarily, it could take a while to justify the cost of the off-grid system. But it would have cost close to $14,000 to bring power into my facility since I do live a fair stretch from civilization. Hence, the payback justification was quite immediate. The real payback for me, however, came from the psychological and philosophical change to my very core that’s worth way more than the dollars I have or ever will have saved. It is actually no longer a matter of dollars saved. I have comfortably found that I just don’t need much of the stuff, the very same stuff that I didn’t even need before but didn’t realize it. Ahh, the Zen of it all! My eyes have been opened. And I get lullabied to sleep almost every night in the process of generating the electricity for tomorrow’s use or for the next few days. But there’s only so much Zen, only so much financial philosophy, I still have some power needs and some of which are still unmet. So let’s get back to business. I have been so impressed with these units and blessed with a good winter wind that I went out and bought another unit to reduce my dependency on the gas generator especially during the winter and to provide a longer storage time for the produced power. In the next few installments of this article, I will detail the installation and testing of a new wind generator as it springs to life here on my rooftop. We’ll talk about the parts, the mounting, the wiring, and the monitoring of the power. We’ll talk about controlling the power as to avoid burning up your batteries prematurely… a lesson hard-learned here. In any case, I can hardly wait for the new song, the new lullaby in quadraphonic stereo format. Furthermore, I can hardly wait to tell you about it. The choice was not straightforward, but not overwhelming like walking into Wal-Mart with no plan. 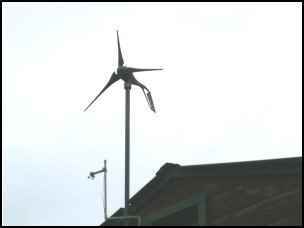 Do I enhance my system with additional solar power or another wind generator? With 410 watts of solar panels facing the sun, solar power is clearly the major producer for me in the summer months. The sun is high, it hangs around a good long time and shines more often than it rains. It carries the load through the summer months. In the winter, things are markedly different. Low solar irradiance and short days combine to lower my reliance on solar power. Meanwhile, more wind, much more wind, wind almost every day and night, take over the major power producer role here and I end up with almost the same energy production that I claim in the summer… Almost. Like nearly everyone else, I use more energy in the winter. With this in mind, I opted to enhance my winter output and get another wind generator. OK, that decided, which kind of wind generator? Since my experience with the two models I have discussed is so positive, only a fool, or a wealthy nut-case would chuck the experience and go with an unknown. I have talked with some nice folks locally that have gone a different route. These folks have installed those grand pooh-bahs, the behemoths, the mother of all maidens, the 2 to 10 kW (kilowatt) units that are bigger than most of my house’s roof. They mount them on radio type towers and require automatic stair-steps-to-heaven to erect and maintain. Sad to say, all of the folks I talked with (there were three) have had disasters. One of the units crashed to the ground shedding parts for a good long distance, the second one I saw lying on the ground one day in the man’s front yard last spring. It stayed reclined on the ground for a week or more either waiting for parts or for one of the stair-steps-to-heaven contraptions to reinstall it. The third, I could only see if from the highway and one day… it was gone! Except for the now-bare tower. Nah, I like the known, I like clamoring up on a roof, not shimmying up a 60-foot tower with wrenches between my teeth. Either an Air-X or another Mallard, that was the decision to make. In either case, there was a spot for it on the roof already waiting for it. In the end, I opted for, and purchased, another Mallard 800E wind generator because it is so robust, quiet, no internal printed circuit boards, and it will visually balance the house in a harmonious way. I like visual harmony. It is good on the eye. I also like the way the Mallard has performed over the years. While it is true that the Mallard that is currently flying on my roof, on a typical day, routinely puts out measurably less power than the Air-X’s, it is not a fair comparison; a fact pointed out to me by the manufacturer in a nice email stemming from the original article. The Air-X’s are mounted much higher in the wind and have an unobstructed access to the strong prevailing northwest winds as shown in the accompanying picture. The overall height above a surface and unobstructed access to the moving air makes a big difference. 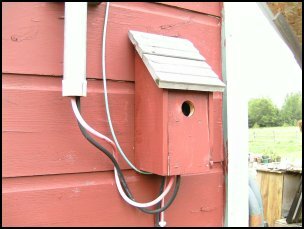 The existing Mallard has less access to the wind, it is shielded by the gambrel roof of the main structure and sits lower to the roof. With its six-bladed 5-foot rotor, it absorbs a lot of energy and I am afraid to push the Mallard much higher into the wind. It also handles wind instability unquestionably well. Another reason for my choice is that the Air-X’s suffer, in my estimation, from too short of a tail. They sing and dance comically in the wind and are very, very active. Perhaps more than they need be. I love to watch them, the music is wonderful, I enjoy the performance immensely. I enjoy their output too. Hardly a night goes by that I don’t fall to sleep lullabied by their song. The Air-X’s do sing louder than the Mallard. But very often, in the midst of a perfect tune, the Air-X’s spin themselves right out of the wind stream, they stall, and then fire up once again as they rotate back into the wind. Fun to watch, pleasant to listen to, but the fact remains, there’s a lot of wind that gets past the rotors without generating electricity. It also has got to be hard on the bearings, yet none have complained nor required maintenance. Like an argumentative friend, these units fight the wind much more than they probably need to, most often they win, but occasionally they lose out and spin down. On occasion, in the higher winds, the foils will enter a flutter stage, here, blade tips are literally ripping and tearing through the wind, vibrating mercilessly, and scaring the bejesus out of the animals or anything else that is in or around the house, just as if Santa Claus fell out of his sleigh and landed on a hot metal roof in the middle of the night … with ice skates on. Whoa! It makes food fall out of my mouth when it happens at dinner. The Mallard, it seems, is much more tolerant of wind instability. It stays focused in the wind, it has a job to do and it does it well, does it with less noise, less stress, and more confidence. It gives me the feeling that it will outlast the wall it is mounted on. It will probably be there when I am gone, just like the old Jacobs or Windchargers in the dust-bowled ’30s. The Air-X’s are indeed robust as well, and I wholeheartedly recommend them, but on a rooftop, they seem to work harder than they need to in order to get the job done, i.e. to get those little electrons inside the battery bank. I suspect that a clear mounting of the Air-X’s on a tower would eliminate the turbulence, but an old buzzard like me is not about to climb a tower or lay one down when the time comes. Because sooner or later, there will be a time for real maintenance. It just hasn’t happened yet and a tower is just not in the plan for me. I will consider another Air-X for the 5th wind generator perhaps next year but that will be measured against the performance I see from the upcoming Mallard unit. Each genny has its own comfort zone. Like a race car with a hot camshaft, each unit seems to have a sweet spot at which it prefers to run. At the sweet spot, the rotors seem to turn effortlessly, the music is steady, unstressed, comfortable. The Air-X’s enjoy the wind at 20-30 mph, the Mallard likes a stronger dose. Much stronger. Scarily stronger! The Mallard is content in a wind speed around 30-40 mph, even higher, although it works well at lower wind speeds, too. It is smooth, deep-voiced, even-keeled. There’s little wasted motion, no unsureness or burden, just a willingness to move and capture the wind. It faces the wind continuously, almost effortlessly, even though it does not possess a slip bearing that would allow it to continually rotate to follow the wind 360 degrees around like the Air-X’s do. Oh yes, it rotates to face the wind in any direction, but a special clamp is used that allows the wires to twist inside the mast as it does. I thought this concept, initially revolting to me, would be problematic. But not so, not so at all. Wind just doesn’t behave in such a manner to corkscrew the unit round and round its axis on the pole continuously like a merry-go-round. It blows from one direction, moves to another, and then again to another. On a rooftop, even more turbulent is its behavior, the wind will buffet the tail vane left and right, but it rarely gets it to completely spin in circles more than once or twice before it can unwind itself. In between gusts, the Mallard leisurely unwinds itself when the wires become taut. I use a highly flexible and tough rubber coated wire like welding cable at least for the wires that run down the mast. Nevertheless, to ease my concern, in addition to using the more flexible wire, I fabricated a connector on the wires at the bottom of the mast and installed it in a birdhouse (see the accompanying pictures), so that I could easily break the connection, like unplugging an extension cord, to allow the twisted wire inside mast to unwind periodically. I’ve allowed it to unwind on a couple of occasions and was almost disappointed that there wasn’t any serious twist in the wire to unwind. I’ll do the same for the next unit I install. The Mallard is not afraid of the wind. It keeps putting out more and more power as the wind increases in intensity. The Air-X’s, while steady and reliable, will shut down and preserve themselves for another fight later on when the wind is more respectful. They do a great job at the moderate wind speeds, even better than the Mallard, but when the air gets tense and you can feel the trouble in the air, the Mallard 800 seems to fill itself with an intolerable brightness; I see war in the eyes of my big green friend. It doesn’t stop putting out power. It would rather start a fire than to quit producing. Scary, in and of itself, it’s willingness to output power that is endearing to me! And now that I have confidence in it, I let it fly and do what it is born to do. Last winter, when the winds blew strong out of the northwest night after night, I let it do its thing, all winter long. Rarely did I have to shut it down due to overproducing winds. I have installed a dump load controller to handle this kind of contingency and it has worked well. On the other hand, there were a handful of occasions during the winter months where I ran low on power and had to fire up the gas generator. The winter sun, low in the sky as it usually is here in the northland, could not carry the burden like it does in the summer and the wind generators have to work for me. Between the steady output of the Air-X’s and the less frequent, but mighty outbursts from the Mallard responding to the winter wind howls, my meager power needs were substantially satisfied… without stress, without repairs, without a monthly bill. I’m up for the next wind generator. So that’s the plan. Decision is made, parts purchased… stay tuned, we’ll add the next wind generator together over the course of this summer. Stage 1: Circuit Design and Parts Acquisition coming up next. Now, where the heck are my tools?